Dr. Nimi Wariboko is Walter G. Muelder Professor of Social Ethics at Boston University School of Theology. You don’t have to understand tongues speech to understand Barth; but you must understand Barth in order to understand tongues. God’s Word is essentially understand to be in the form of “Divine command” to humans; humans are thus called upon to respond in and through correspondent forms of speech. These divine and human forms of speech are aligned in a way that George Hunsinger calls “asymmetry” (God’s speech takes priority over human), “intimacy” (that the speech actually goes together in history and are inherently connected), and “integrity” (divine and human speech, even though connected, retain their respective divine or human reality–God’s word remains God’s word, and human word remains human). God’s Word is full of grace, but it is also shattering and disruptive to human speech. God’s Word upsets our basic expectations of how it is that God works and speaks. God’s Word remains ec-sistent to the human, i.e., it remains “outside of us” yet is constitutive of our being; it is not “inside and constitutive” (ex-istent) of our being as humans. These three features, according to Wariboko, are useful parallels in Barth to a Pentecostal understanding of tongues. In short: 1) tongues comes from God in response to God’s Spirit; 2) they are disruptive to normal patterns of human and social interaction, and 3) they constitute the humans from outside rather than from within the human speaker. In order to bring Barth’s theology of language into conversation with a Pentecostal doctrine of tongues, Wariboko appealed to Lacan’s triad: the imaginary, the symbolic and the real. 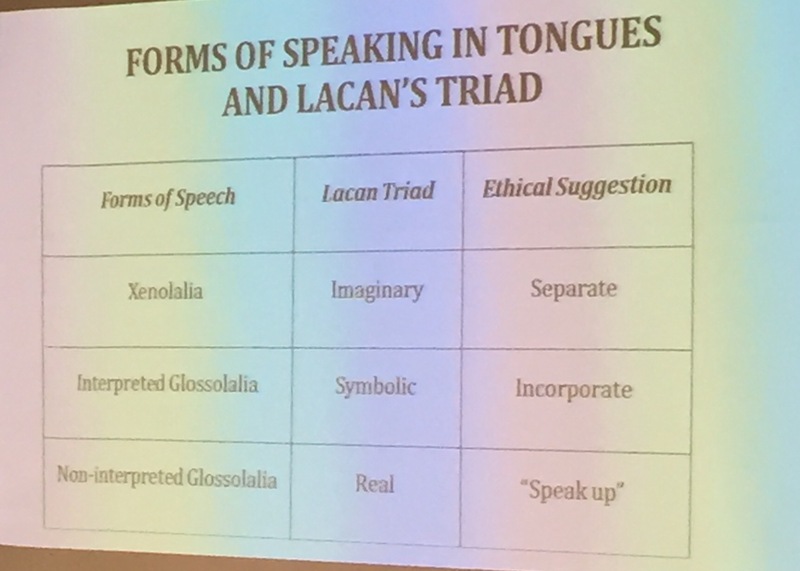 In this regard, there are three forms of tongues spoken of in Scripture, each corresponding to a leg of Lacan’s triad. Xenolalia (speaking in many recognized languages – cf. Acts 2) corresponds to the “imaginary” in Lacan. Here the coming together of the disciples to speak glory to God through many existing languages highlighted the “separateness” of the nations, whether Jew or Gentile. However, by speaking in these known languages in the context of single event (Pentecost), a new–separate–community identity (i.e., a community not limited to linguistic barriers) is formed which transcends the limits otherwise imposed by different langugages. Interpreted Glossalalia (speaking in speech which is unintelligble but translated – cf. tongues and interpretation of tongues in 1 Cor 12:10) corresponds to Lacan’s “symbolic” category. Regardless of what the words or sounds of the “language” being spoken is of less relevance than the fact that God himself gives interpretation of what the words/sounds mean. By so doing, both the speaker and hearer are incorporated in the larger community of faith in their speaking and hearing. 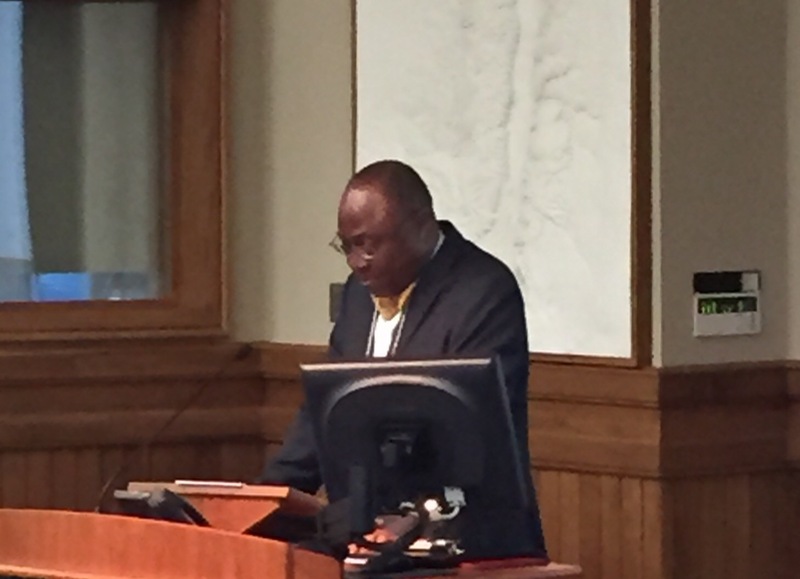 Wariboko completed his paper by drawing out the common ethical assumptions underlying both Barth and many forms of Pentecostal theologies of tongues in the Western tradition. Here he pointed out that common to Barth and Pentecostal theologies is the notion of the “nakedness” of the ethical subjectivity. For Barth, it is assumed that the human speaks in obedience to God’s command but cannot be based on any external factors. This is because such speaking is entirely by grace. Likewise, the Pentecostal assumes that anyone, regardless of gender, culture, or back ground, can speak in tongues by the free working of the Spirit. However, Wariboko sees a philosophical parallel to Kant’s categorical imperative, which assumes that doing the “right thing” ethically is assumed to be true universally of every individual, regardless of culture, language, or location. So, though Warikobo sees Pentecostal theologies of tongues and Barth being aligned at many levels, not least of which is seeing it as the disruptive, free working of the Spirit in humans, he also sees both in need of further supplementation with an attention to the cultural and historical location of the exercise of that human freedom under the Spirit.